ExpertPdf is an easy to use, yet powerful pdf library for .NET. It contains a top class html to pdf converter that can be integrated into any .NET application in a few minutes. ExpertPdf is in business since 2007 and it's being used by thousands of companies world wide. Here you can view a list of our best known customers. Check out this page if you are interested in a version history of our html to pdf converter. With ExpertPdf Html To Pdf Converter you can convert full web pages to pdf. The web page can be an url or a local html file. ExpertPdf Converter can convert a raw html text. You can specify a base url if the html code references external css files or images. The generated PDF can be output to a file, stream, byte array or pdf document object that can be further prelucrated by our sdk. With ExpertPdf you have full control of pdf page size, orientation, margins and many more elements. You can have headers and footers displayed in all pdf pages. Full html support is included for these sections also. ExpertPdf Html To Pdf Converter can preserve the links from your web page into pdf. Alternatively you can disable the links if you do not want them to appear in PDF. ExpertPdf automatically inserts page breaks when needed, paying attention not to break lines of text or images. Custom page breaks can be added using simple page-break-before and page-break-after css styles. If you do not want to convert the whole web page to pdf, you have the option to convert only a section of it, specified by the html element id. If you need to convert most of your web page to pdf, this feature allows you to hide certain elements, like a print button or menu. 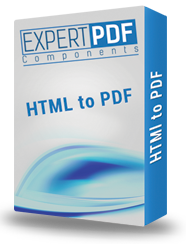 With ExpertPdf Pdf Library for .NET you can add several html pages to the same pdf. You can also merge existing pdf documents with the one that is being generated. ExpertPdf supports Windows Authentication (automatically login for the current Windows user), HTTP Authentication (set user and password) and Forms Authentication (pass the application cookies to the converter). Many websites have printer friendly style sheets. ExpertPdf can convert to pdf the webpage displayed using @media print instead of the default @media screen. ExpertPdf offers full control of pdf bookmarks (outlines). You can also set the converter to automatically generate bookmarks (outlines) based on certain tags or css classes from the converted webpage. ExpertPdf Converter supports digital signatures. Other pdf security options, like setting a password or controlling document permissions, are also available. ExpertPdf can give full details about certain html elements positions in pdf. For example, you can know where a certain image from your webpage was added to the pdf document. Our pdf converter has full support for locally installed TTF or OTF fonts and can also handle web fonts (TTF or WOFF format). Starting with v9, besides the IE html rendering engine used by the older versions, a new rendering engine was added. The new rendering engine is internal, with no 3rd party dependencies. It is based on WebKit and can render html5/css3. ExpertPdf Pdf Converter is very easy to use. You can convert a web page to pdf with a single line of code.